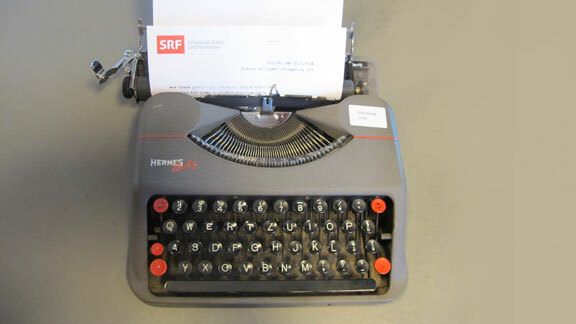 Swiss Radio DRS had a two hours feature on typewriters on May 30th. I was honoured and happy to be invited as an expert. My friend Alfred and I had a great time, and response from the audience was great. The show featured interviews with Swiss writers Franz Hohler and Milena Moser, fellow typewriter collector Stefan Beck, a long-standing typewriting teacher, professor Sandro Zanetti (on the relationship of writers and their instruments), and myself (in particular on Hermes / Paillard typewriters). There was Q&A, and mails kept pouring in during the show. Everybody had a good time. There was a fine selection of typewriter songs as well. On the train back home, a man commented on my typewriter case saying that he had just listened to a show on typewriters this very morning - and I heard one more typewriter story. For those proficient in Schwyzerdütsch (Swiss German), you can listen to and download the show here. I have a confession to make: I killed a typewriter. Through ignorance and the injudicious application of a screwdriver (plus placing my trust in a close friend who may have overestimated his own skills), my Lettera 32 appears to have been damaged beyond reasonable repair. There is a jam in the carriage, and I fear that the escapement dog is either snapped or twisted and jammed. I cannot describe how heartbroken I was when I realized that the repair was beyond my ability. That said, the partially-disassembled carcass of my once-faithful machine is up for grabs. If any of you out there think that you can effect a miraculous repair, or if you need parts, it's yours for the price of shipping. Robotranslated version of the story. Yet another article about typewriter repair / the resurgence of collecting, this time in the San Francisco Chronicle. Tom from Life in a Typewriter Shop is featured in this local-news human interest piece. His bit starts up around the 1:00 mark. Quick, before Blogger melts down again! A few years ago, I got all ambitious over on Clickthing and declared an elaborate celebration of Typewriter Day, known to mortals as June 23. This is the anniversary of the date when Christopher Sholes received the U.S. patent for his device that in time grew to become the one we know and love. Inspired by shordzi's excellent videos, I wondered... do you think we could get everyone to shoot a little video of themselves typing on June 23rd? Perhaps write up a little bit about where you were, what you were typing, etc.. Post on your favorite video-sharing site, and we can make a gallery here after the fact. What is the word for a typewriter blog? A typecast is a post on one, the typopshere is the collection of all of them, a typospherian is a writer of one (though I prefer typewriter-head), but what's the blog itself? We roughly average about 100 views a day, some days flirting with 200 views. It's pretty steady all day, so my obsessive reloading isn't skewing the results. Firefox accounts for 49% of browser traffic (see obsessive reloading, above.) Chrome, IE, and Safari are neck-in-neck around the 15% mark. All time most popular page: the initial roll call post (155 views), followed by the Los Angeles type-in announcement (56 views) and then the origin of the term "typecasting" (46 views.) I've surely just messed up those numbers by linking to them. Traffic comes from the same countries as our map, plus Canada ranks highly. Any Canadian bloggers hiding out there that want to be added? Just post a reply. "typosphere" as a search term leads people here the most, in various forms, though "matt cidoni" and "la vie graphite" are vying for fifth place. It's a battle royale for this dubious honor. This site is still ad-free, and supported purely by your collective awesomeness. Keep those fingers on the keys! According to some blog comments on this site, looks like you typewriter-heads want to do some more collective writing. Let's get another round of Round Ribbon going. You know the drill, someone types a beginning to a story and then sends it off to someone else for the next part, and on and on. Last time there was a bit of confusion on my part: I said there was a limit of 4 per "team" but there's no limit on teams. So everybody who wants in can participate. To get in on this, leave a blog comment here if I already have your address, and if I don't, send me a line at (typed dot letter at gmail dot com). Don't miss this TV segment about Rochester, Minnesota collector Alan Seaver. It's well produced, and Alan does an excellent job of introducing the world of typewriters. Anyone who sees this and doesn't want a typewriter simply doesn't have the gene. The goodness starts at 10:35.